As most of you know, I rarely read actual books. It's mostly scientific tomes and comics for me, thank you. 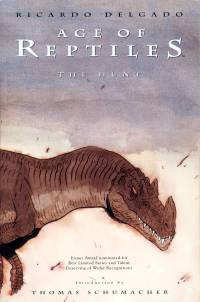 A very long time ago, I discovered Ricardo Delgado's excellent Age of Reptiles series. 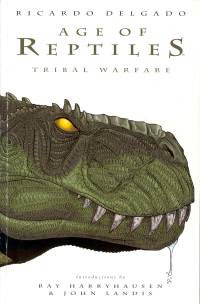 The first "volume" is entitled "Tribal Warfare" and details an ongoing feud between a family of tyrannosaurs and a group of dromaeosaurs. It is lavishly illustrated and wonderfully layed out. It is among my favorite comics. 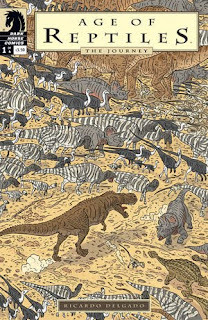 Several years later, another volume of the comic came out: "The Hunt" tells the story of a little allosaur whose parents were killed by a group of Ceratosaurus. After growing up, the allosaur takes it upon himself to hunt down the ceratosaurs and exact his revenge. It all sounds very pulpy, but the stories work well. The end of "The Hunt" is especially interesting. Actually, the end of "Tribal Warfare" is pretty freaking epic, though nowhere near as subtle. Well, this month, the first issue of a new volume came out, entitled "The Journey." I picked it up the other day and I'm kind of on the fence about it. The quality of illustrations from "Tribal Warfare" to "The Hunt" took a pretty big hit, and "The Journey" looks considerably worse. It's much looser and abstract. There are tiny moments of inspiration, such as a baby Triceratops riding on its mother's nose, but the sense of motion that was so prevelant in the first two volumes is all but gone here. "The Journey" looks more like a series of photographs, or a collection of establishing shots. It's being released on a bimonthly schedule, so I'm eager to see where the story goes (if anywhere at all) in January. Wicked awesome! I'll totally have to borrow those from you sometime, they sound very interesting. Am I the only one who notices the ornithomimosaurs in the third picture basically look like ostriches without feathers? I mean down to the color scheme and everything. It was a huge let down after the first series.